For all the glory of the consoles, they do tend to eat up a lot of space. It's nice, therefore, to see the compact designs of a lot of the table models. Even though there is still some dead space in a lot of them, compressing the innards of a console into a space 1/3 the volume is still something of a feat. (Smaller sets are also a LOT easier to force into the Honda.) 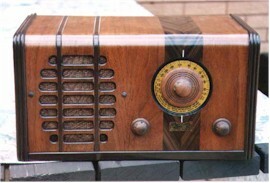 On this page, I am going to focus on the horizontal table radios. 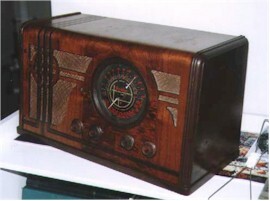 The second radio I ever bought was one of these. 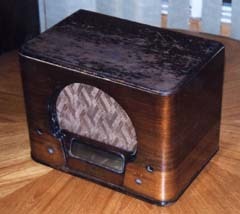 This is a Canadian-made radio from the early thirties ('33-'35), as best as I can tell, and it is mounted on this base which allows it to rotate back and forth (for reasons as yet undetermined). It's considerably smaller than it appears in this picture. If the whole set is 9" across, I'd be surprised. The finish looks as though it will be fine with just a solid cleaning and polishing/waxing. The chassis is not running as yet - we'll see just what is required there. Not sure where exactly this was produced. It came to me from near Montreal, but has an old safety sticker from Ontario on the back. Just another little mystery to solve. Neat set, though, eh? Several years ago, I missed out on a set like this in Ottawa. When it came up for auction, I wasn't about to let it escape again. Technically, this is a middle-of the-road set, but it has one of my favourite cabinet designs ever. The finish has cleaned up very well (hand cleaner, yet again) and the set works, albeit not perfectly. The tuning caps are jiggly because the grommets have dried out, and this makes for a poor connection. Pretty minor fix, I think. This is an interesting set that is waiting for repair. Each one of those lines on the dial is a separate band. The condition of this set is iffy. I've glued down loose veneer on both corners and the top, and have cleaned out the innards. 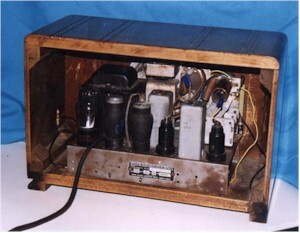 There is no life as yet because the 6V winding on the transformer has gone and will have to stay that way for the time being. 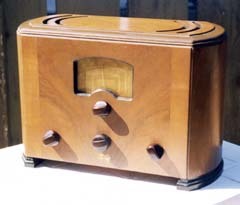 This radio is considerably larger than one would first guess from looking at this image. It should clean up well, though. 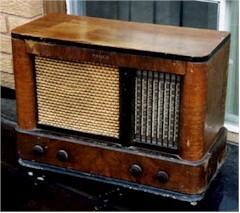 This is a Canadian Philco for which there is no US equivalent, though there are a couple sets from 1940-41 that bear some resemblance to it. The picture on the left was taken after cleaning with hand cleaner. 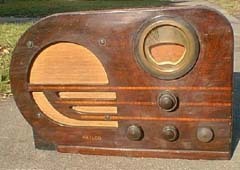 This radio definitely could be included in the "what was I thinking" category, except that I felt I had a couple of reasons for getting it. I gave away the only other Phonola I ever had, and always missed the bilingual dial these things have. (I was kind of shocked to find out that they were made in Kitchener - I was sure it would have come from Montreal.) The case is solid, has no chips, and the dial plastic is fine. While the speaker is missing, the way it is mounted lets me get away with a non-original replacement (though it will need a choke). It is missing some tubes, but I now have the schematic, so I at least know what they are. Anyway, it was worth most of the ten dollars I spent on it. The cabinet cleaned up (left) not too badly, again using hand cleaner. 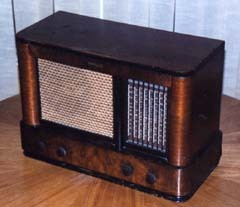 This radio shares a lot of design elements with the RCA 4X, which means I can finally stop being bitter about losing out on that radio. It seems to have a problem with the gain, but otherwise is just about ready. The original finish has been recoated, and I'm not too fond of it as it muddies the wood grain. The wood is in great shape, though, so the refinishing should come out well. The dial is gold-coloured metal. The speaker is in the back. 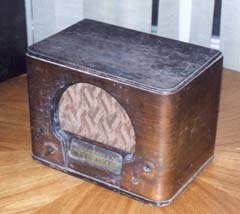 Got this radio in a trade for another RCA, the A-23. I had originally wanted to trade for a nice little Airline radio (a make I hadn't seen here before and have not seen since), but was too late on it. I went for this one instead. The on/off switch was broken, and someone had mounted a toggle switch on the side. This was corrected and all necessary veneer patches made. It had been refinished in some kind of varnish that was flaking off, so I had no worries about doing it again. The striping is my own idea. The details were there, but I don't think they were brought out the way that I have done them. We thought that there were some distortion problems with this radio, but it turned out that the speaker cone was just out of alignment. Gave this radio a couple of years back to one of my best friends. Got away with making a mess of this radio. It was too bad, since I liked the styling on it. I decided to try a new product on it that was supposed to revitalize the finish without having to strip it. I thought this was a great idea, since the finish wasn't all that bad. Once I tried it out, though, I found out that this stuff did NOT live up to its billing. 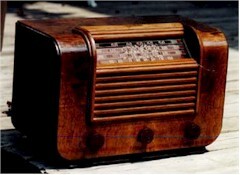 In fact, it burned the top surface of the radio. I stripped it, but could tell it was in trouble. A fairly light-coloured veneer had a pretty distinct dark patch right across the top. I finished the set with a brushing lacquer, and the whole thing came out dark enough that the bad patch wasn't so obvious. Given the fact that it ran very well, I was able to trade it for the 5T-3. 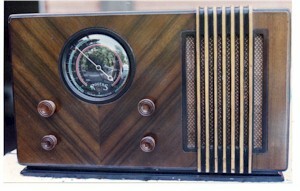 I looked at this radio for a few weeks before getting up the nerve to buy it. 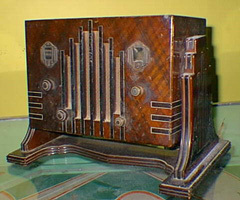 It was a decision between this and a very cool 'Musette' tombstone with one of those thumbwheeled off-centre dials, but was also missing 3 tubes and a speaker. This one, only missing a couple of knobs, seemed a far easier thing to deal with. I was pleasantly surprised to find out that the tubes in it are actually the ones that are meant to be there. The guy claimed it was working, but I didn't particularly believe it. 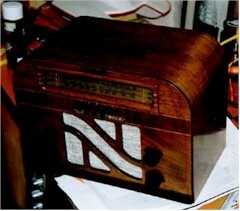 There are a lot of rotten-looking capacitors which are probably standing between this radio and functionality. (Too bad, since they appear to be original.) The cabinet, despite a really ragged appearance, is actually in quite respectable condition. I'm not sure whether it was originally shadowed on the sides, but I'll see what I can do with it. One oddity of this set is that the IF is only 175 kc. 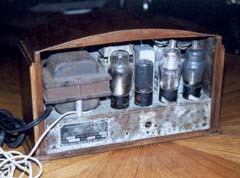 This little Rogers set only has a four-tube chassis (the tubes listed are likely just equivalents - they are far too normal to be real Rogers tubes). It has been refinished by whoever had it previously, though I've yet to decide whether I will try to do it again (odds are pretty good that I will). I don't have the Rogers name for this set. It should be clear on the schematic, once I get one. This set is old enough that the logo still says 'Rogers Batteryless', as opposed to just 'Rogers'. 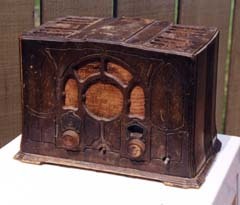 They gave this up within a year or so of the production of this radio. Presumably, the novelty of a 110V radio must have been wearing off. The little foil dials are in good shape, which is not too common. There is also no AVC on this set, so it will really blast you if you hit a strong signal. I got this set for a friend of mine as a gift for her boyfriend. It took a little fixing but virtually no cabinet work. Unfortunately, I wasn't really documenting things at the time and didn't write down anything about it. It was another of the green-dial sets and, true to form, had a small burn hole in the dial right where the needle is pointing. Beyond that, it was flawless. Too bad. Any of you Rogers people recognize it? 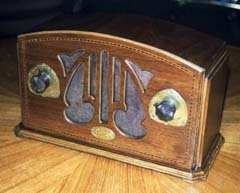 Rogers made a few sets with this enormous front knob. It's hard to tell here, but it's actually made of brass. Five or six of the settings around the outside are for preset stations. The last is a clear window that looks onto the dial. 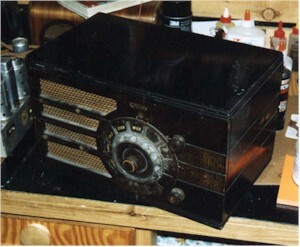 It's a little ungainly on a set this small, but I think this radio will look good when cleaned up. Where that knob really comes across dramatically is on a console. This set is also missing the centre tuning knob, which it looks like I'll have to have made up. In every collection, there is one set that was picked up as something of an afterthought and has proven to be an out-and-out nightmare. This one is mine. Just to start with the cabinet, all the veneer was delaminating and had split on both sides right at the curve. What was holding together had been glue-gunned into place, and the glue was coming out all over. The chassis, which we sandblasted to see if there was still any metal in it, was filled with a bunch of random tubes someone took from a box. 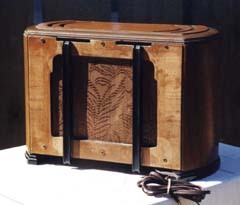 (One of these, however, was a very rare 20J8, which found a home in a Deforest-Crosley console, so nothing is ever THAT bad....) Five years later, this radio is finally making some recognizable sounds, but is still nowhere near being done. "Dragon" may have been an apt name for it. 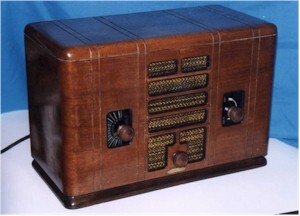 Serenader, as I understand it, was a department-store line of radios. Viking was another example of one up here, Airline and Silvertone would be US examples. Simpson's sold them, if memory serves. 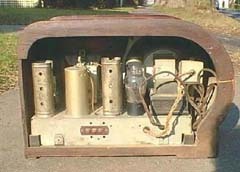 The chassis for Serenader were built by Grimes radio in Kitchener, which I have also seen inside 'Lyric' radios, so Lyric may also be a Simpson's line, or a subset of Serenader. I quite like this set. The finish came out quite well using a brushing lacquer. 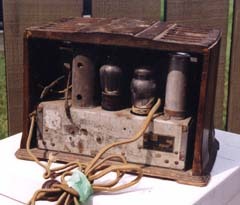 One odd detail: The cabinet had only one hole drilled for dial lamps, despite the fact that there were two lamps. We put in the second hole. Don't know if we should have, but it certainly evens out the way the dial is lit. This is the big brother to the other Serenader. I'm really fond of the dial on this one, though it's not really efficient. For all the activity on it, with the lines and local stations and the double pointer, it only lists one of its two bands really effectively. I've never really figured that one out. This picture is unfortunately very flattering to the finish. It really needs to be redone. Runs like a charm, though, and has a great cabinet design. There's no way that those knobs are original, just judging from the wear pattern on the lacquer behind them, but they do the job. This set has it's original documentation with it.